A monthly non-denominational Welsh language women's periodical. The periodical's main contents were biographies of prominent women, articles on religion, temperance, women's rights, fashion and keeping a home and a family, alongside reviews, short stories and poetry. 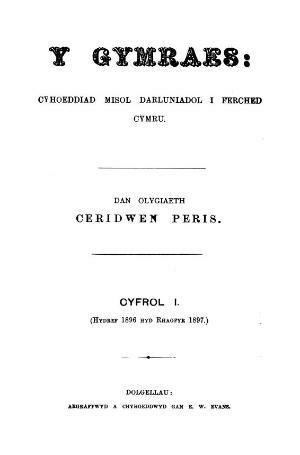 The periodical was edited by the author, Alice Gray Jones (Ceridwen Peris, 1852-1943) until September 1919, and subsequently by Mary Jane Griffiths (Mair Ogwen).